For many of us growing up during the Eighties, Top of The Pops was eagerly awaited Thursday night viewing. Some performances remain as fresh in our minds as the day we first saw them. Who can forget Culture Club’s debut on the show, and the subsequent discussions about Boy George’s gender the following day at school? Then there was Adam Ant’s performance of Goody Two Shoes, when he danced across the studio from stage to stage wearing those red leather trousers. For me, The Beat’s appearance in May 1983, when they first performed Can’t Get Used To Losing You on the programme, has always held a special place in my heart. As a 12-year-old girl watching Dave Wakeling perched on a stool, looking down the camera with a cheeky glint in his eye, I was left with an indelible imprint on my memory. You can imagine then how I was feeling when I stepped onto The English Beat’s tour bus to interview him for my next book. Any nerves I may have had soon disappeared as we got chatting … and chat we did, covering everything from politics, racism and Greenpeace to his Vox teardrop guitar, musical influences and songwriting. In fact, there wasn’t much we didn’t cover in our hour and a half interview, all of which you will be able to read about next year when More Eighties is published. Having finished our interview, I was delighted when Dave invited me to the band’s gig that evening. Based in California, The English Beat were in Folkestone, Kent to headline the Skabour festival, as part of their current UK tour. Fronted by the Brummie singer, the band comprises Matt Morrish on saxophone, Kevin Lum and Minh Quan on keyboards, Nucci Cantrell on drums, Brad Engstrom on bass and, with apparently limitless energy, King Schascha toasting. Bringing us all The Beat’s favourites, such as Mirror In The Bathroom, Stand Down Margaret, Too Nice To Talk To and Save It For Later (or Save It, Fellator according to Dave’s schoolboy humour! ), the band delivered a top notch set that had everyone singing and dancing along. So much so, that I didn’t hesitate to accept an invitation to the band’s gig the next night at The Forum in Tunbridge Wells. A more intimate venue than the previous evening, it was the perfect setting to perform new material Never Die. One of the tracks from a forthcoming album to be released next year (I’ve heard a preview of a few of the tracks and they are A-Ma-Zing! ), Dave wrote the song in memory of his late father. Beautiful both lyrically and melodically, the song demonstrates not only a huge songwriting talent but a rare insight into love and life. It’s already a firm favourite with me. The English Beat still have a week left of their UK Tour, so try to catch them before they head back over the Atlantic. The music is first class, the vibe is great and Dave Wakeling still has that twinkle in his eye. At the end of April, I went to see The Selecter’s Pauline Black and Arthur ‘Gaps’ Hendrickson perform with Jools Holland’s Rhythm & Blues Orchestra, at Margate’s Winter Gardens. Having previously seen The Selecter play live to their Ska and Two-Tone fan base, I was eager to see how this collaboration would work, playing to a diverse audience in a seated venue. Opening their set with The Ethiopians’ ‘Train To Skaville’, the duo left us in no doubt in which direction we were heading. As Ms Black told us to “mind the Gaps”, he, in his inimitable style, wanted us to “wind up your waist”; it became impossible to sit still. Looking around me at the rest of the audience, who remained firmly in their seats, I pondered the etiquette of climbing over my neighbours, so I might dance in the aisle. Having to content myself with a bit of chair dancing as the pair launched into ‘Secret Love’, a track which beautifully showcases Pauline’s vocal talents, against Hendrickson’s top-tapping toasting, I could hold back no longer. I was up and at ’em! By the time they performed The Selecter favourites ‘Too Much Pressure’ and ‘On My Radio’, even the unlikeliest of characters were up and moving, if not quite skanking. All testament to the energy and frisson coming from onstage Two-Tone team. It was almost unbelievable that these were the same people I had been talking to a couple of hours before the gig. Pauline had agreed to be interviewed for my next book ‘More Eighties’. I must confess, I was more than a little nervous as I arrived at her hotel. Not only do I consider the Queen of Ska to be a musical great, but as one of the few strong female role models of the Eighties, I had afforded her semi-iconic status since I was in single figures. I needn’t have worried. Walking across the hotel foyer, looking as impeccably stylish as ever, Pauline greets me with a warmth that immediately puts me at ease. As we begin the interview, we’re joined by Gaps, someone whose dynamic, high-octane stage persona bears little resemblance to the softly spoken, laid back man who tells me he still considers it an “honour” to be in his position, performing and writing songs. Pauline is poised and eloquent as she explains how their song writing has evolved over time, with the pair now having the freedom to encompass a broader range of musical influences. What hasn’t changed is their commitment to quality. Determined not to fall on the retro/revival bandwagon, The Selecter continue to produce and perform new material which, whilst maintaining the band’s distinctive sound, delivers a fresh, contemporary take on Two-Tone. Listen to last year’s ‘Subculture’ album, and you’ll know exactly what I mean. We covered a host of topics during our conversation, from perilous tours to Beyoncé’s ‘Lemonade’, multiculturalism to that Michael Putland photograph, all of which will feature in ‘More Eighties’, to be published next year. Every question I posed was given a full, considered answer, offering an insight into The Selecter’s music and history, but also glimpsing the real people behind the band. By the end of the interview, I was left with a real appreciation of two people, whose natural creativity and musicianship can be sometimes lost amongst the performance elements of the band, and its Two-Tone image. I was also left with a little bit of a crush on the unassuming, off-stage Mr. Hendrickson! Pauline Black and Gaps Hendrickson are touring throughout the UK with Jools Holland’s Rhythm & Blues Orchestra until the end of the year. Click here for tickets. Roger’s Ranking High For Me, Full Stop! 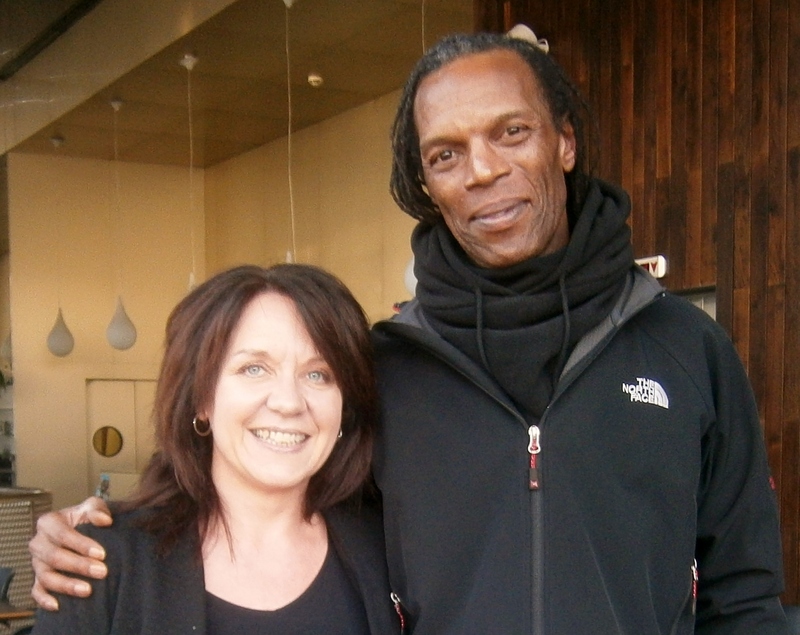 As you may have guessed from my previous post, last Friday I had the pleasure of interviewing Ska and Two-Tone luminary, Ranking Roger. As The Beat’s only remaining original member, Roger has performed with the band on and off for the past 36 years, since joining them in March 1979, at the age of 16. He heads a current line up of Steve Harper (guitar), Andy Pearson (bass), Matt Godwin (saxophone), Ocean Colour Scene’s Oscar Harrison (drums), and joining Roger on vocals is his son, Ranking Junior. Having witnessed the high energy and powerful dynamism between father and son, when they played The Quarterhouse in Folkestone later that evening, I can’t help but feel that Roger’s view “It’s great on stage. I’ve got no complaints. He backs me, I back him,” is typically understated. Within minutes of meeting the Brummie musician, he has apologised for the late start to the interview, something for which he can hardly be held responsible. The band’s arrival in Kent was delayed by a traffic accident; the interview Roger gave to BBC South East Today, prior to mine, overran. Oh, and it was Friday the thirteenth! During the interview, we cover a range of topics , from politics, racism, and social change, to music, the 80s, and performing, plus much more in between. The full interview will feature in my next book, “Your Eighties”, out later this year, so you will have to wait until then to discover the errand David Bowie ran for Saxa, when The Beat supported the stylish singer on his Serious Moonlight Tour in 1983; or to find out what happened when, as part of Special Beat, Roger played to a crowd of “so-called Nazi Skinheads” in the former East German city of Jena. Believe me, the recollections are well worth the wait. As we talk, it becomes apparent that Roger places great value on the fact that he remains without any sign of an inflated ego, despite spending over three decades under the scrutiny of the public eye. “I could never be rich enough to be a bighead, so therefore, I’m glad that I didn’t become a millionaire,” he reflects, as the pounding of drums, pulsating through the venue, signals the beginning of The Beat’s sound check. Not wanting to add to the band’s already time-pressured schedule, I reluctantly bring the interview to an end shortly afterwards. I was later to discover that I wasn’t the only one who felt the interview had ended prematurely. About an hour later, Roger rang me to ask if I wanted to talk some more, now that the band had finished sound checking. Which is how I found myself to be in the somewhat surreal situation of sitting in a pub on Folkestone seafront, with Ranking Roger, at the same time as the BBC interview he had given earlier aired on the pub’s large TV screen! Regardless of what had the potential to be a flashing neon alert to Roger’s presence, we were able to continue chatting uninterrupted. It was only as we returned to The Quarterhouse, that queuing fans inside the venue began to stare in disbelief, as they noticed the man they were lining up to see, strolling along the street. Earning the title of Most Grounded Man In Music, Roger then chose to enter the venue through its main entrance, talking with members of the waiting crowd, en route to his dressing room – there are no stage doors or airs and graces for this man. Then, of course, there was the music. With all The Beat’s classic tracks from “Hands Off She’s Mine”, “Too Nice To Talk To” and “Mirror In The Bathroom” to “Tears of A Clown”, “Rough Rider” and “Save It For Later”, alongside tracks from some of Roger’s other projects, such as “Return Of The Dread-I”, as well as Ranking Junior’s own creation “My Dream”, there was something for everyone. Looking at the audience, “everyone” was there – not only Skinheads, Rudeboys and Rudegirls, but people of all ages, out for a fun evening of good music. All I can say is, if you’re looking for the same, then The Beat are top ranking, full stop! Today sees David Bowie celebrate his 68th birthday. Although the chameleon-like performer has seen a number of character transformations since his 1967 release of “The Laughing Gnome”, the song has remained in my consciousness, thanks to its lyric “then I put him on a train to Eastbourne” (my Dad’s home town). This gimmick track may have been my first exposure to Bowie, but it didn’t deter me from exploring his subsequent releases, and becoming a huge fan in the process. Although I appreciate the genius of his Ziggy Stardust period, my favourite Bowie music is that released around the time of his 1983 “Serious Moonlight” Tour. Stylish and sophisticated, Bowie’s appearance not only echoed the class of his music, but the time in which it was written. In recognition of the birthday boy’s brilliance, here is my favourite track from that time, “Modern Love”.